Fish and flows in the Gwydir River were the focus of a public forum held at Bingara in July 2016. Local anglers, hatchery operators, government agencies and volunteers gathered at Bingara’s newly established rural learning centre, ‘The Living Classroom’, to hear the latest on research projects and water management strategies that support local native fish. The forum was also an opportunity to highlight local concerns including cold water pollution from Copeton Dam, fishing compliance, public access to rivers and water management to benefit multiple stakeholders. Senior Wetlands and River Conservation Officer with the NSW Office of Environment and Heritage Daryl Albertson said the forum was a great opportunity to meet locals and share information. “The day generated a lot of discussion, allowing recreational fishers to provide feedback and become better engaged with the relevant government departments,” Mr Albertson said. “This is the first forum of its type held for many years in the catchment. The local recreational fishing sector has historically been fully engaged with river and water planning to obtain the best outcomes for fish populations in the Gwydir. They have been key knowledge holders and strong advocates providing advice for native fish communities in the valley. It is my hope these connections can be restored and strengthened and this forum can become an annual event, coinciding with the Bingara Orange Festival,” he said. Participants in the Fish and Flows forum held at ‘The Living Classroom’, Bingara. Photo R Hutton. Speakers from a variety of government agencies presented at the forum. Tony Townsend, Senior Fisheries Manager from NSW DPI, provided an overview of the latest fish and flow management framework being used to guide planning processes, as well as additional complementary activities, including creating better fish passage, addressing cold water pollution, and improving fish habitat. Daryl Albertson, OEH, provided an overview of environmental water management in the Gwydir, highlighting the planning processes and people involved, objectives for use of water, outcomes achieved, and opportunities to be involved in future activities. Mr Albertson also highlighted the recent low flow released in the Gwydir that was managed to improve the condition of the Gwydir River and support the needs of native fish at a time of low oxygen risk. David Ryan, Aquatic Ecologist from NSW DPI Water, gave an update on the progress of Water Resource Plans in the Gwydir, highlighting how fish data is being used in combination with other environmental data and water use information to identify priority risks in the system and guide potential management actions and future research. Dr Gavin Butler, Research Scientist from NSW DPI Fisheries, provided an update on the latest fish monitoring information being conducted as part of Long Term Intervention Monitoring program in the lower Gwydir. 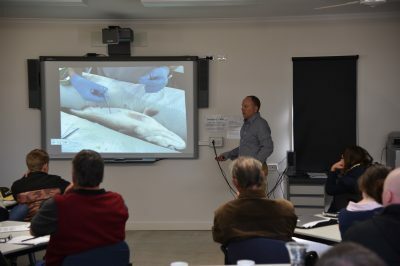 Dr Butler gave an overview of the fish community in the lower Gwydir, and highlighted the fish movement study of the program that has just commenced looking at the movements of Murray Cod and Freshwater Catfish. Gavin Butler from DPI Fisheries was one of several speakers at the forum. Photo R Hutton. 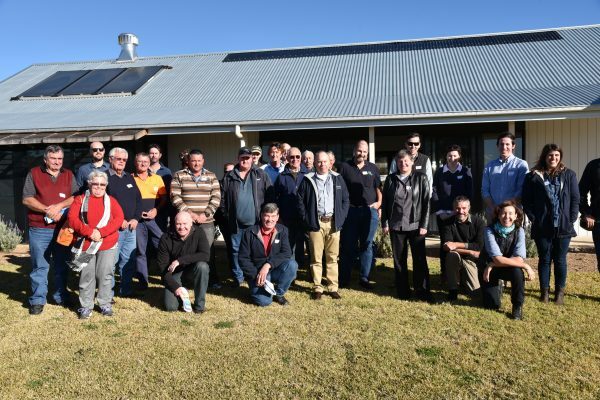 “The event was a great opportunity for key NSW government agencies to partner and engage with the local Gwydir fishing community, and the efforts from all in attending and contributing were greatly appreciated,” Mr Albertson said. “Agencies will follow-up on a number of key messages and report back to participants in the coming months,” he said. To encourage increased engagement with the fishing community, NSW DPI has launched a ‘River Flows for Our Fish’ survey online. Recreational fishers are invited to complete the short survey via a link on the NSW DPI website at http://www.dpi.nsw.gov.au/fishing/habitat or directly at https://www.surveymonkey.com/r/F3YV5NL. For more information about environmental watering in the Gwydir valley, go to http://www.environment.nsw.gov.au/environmentalwater/gwydir-news.htm.